I can’t be more grateful for the best dental care. The entire staff made me feel like family. They are fantastic — the most caring and professional people I’ve had the opportunity to meet. I am very impressed with Dr. Rye’s skills, professionalism, chair side manner, knowledge and experience to take care of anyone’s dental needs. He does everything he can and goes above and beyond to supply you with the best care and comfort possible. I have never found a dentist I could trust like Dr. Rye. Incredible person, always professional, never self-serving. There is no reason to go anywhere else because you could not be in better hands. Natalia is a competitive dancer, and as such is frequently in the public eye. 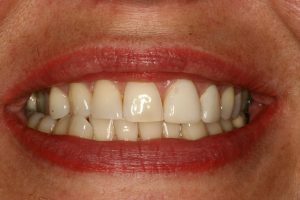 She had been through orthodontics as a child that left her with an unattractive mid-line shift, and a difficult posterior crossbite. Her dentistry was looking tired and worn out. She did not want to go through orthodontics again, and asked me if there was some way to improve her smile and bite. After multiple consultations, several wax mock ups, and several tries in porcelain, we finally created a beautiful smile that Natalia is very proud to show off. She looks marvelous!